Who says vegans can’t partake in the poke bowl trend? 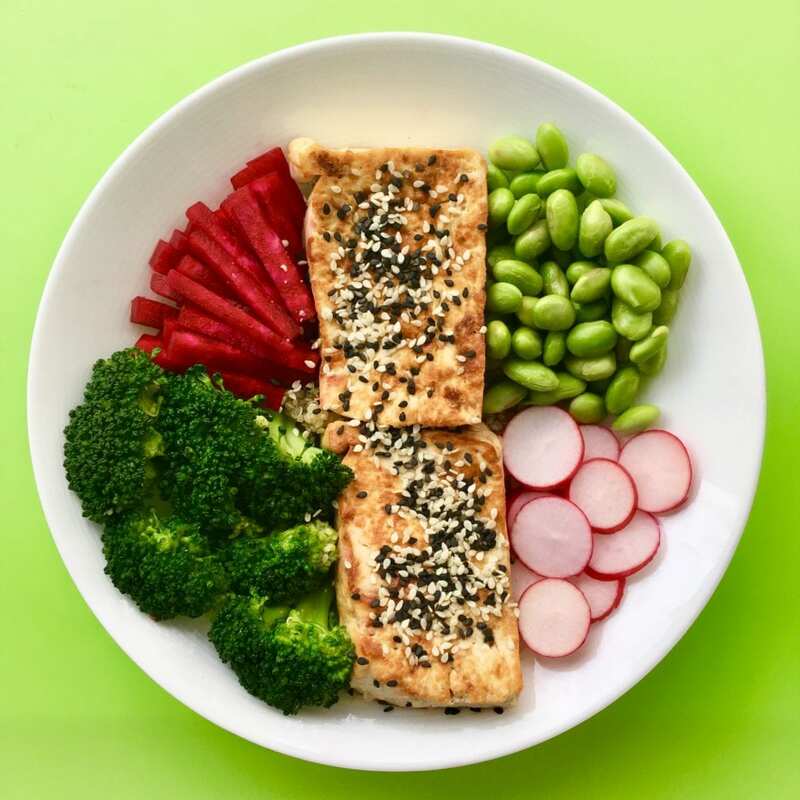 This Hoaxy Poke bowl provides a delicious and beautiful way to load up on a rainbow of veggies (and a rainbow of vitamins), along with a whack of protein and fiber. I chose edamame and broccoli to maximize protein (thinking of a friend who is training heavily) and added fresh (raw) beets and radishes for colour and flavour ‘pop’. Have fun playing with your own combinations and consider adding a bit of fruit as well. Try mango or other tropical fruit – a nod to the Hawaiian origins of this dish. This dish delivers over 30 grams of protein yet only 460 cals which works out to 28% of calories from protein – more than any normal person could possibly need! The dressing is on top of this, but it’s a relatively light vinaigrette. Rinse the tofu, blot dry with paper towels. Your goal is to remove excess water. You can do this by squeezing the block between paper towels, or, wrap the tofu in a paper towel and put it between two plates with something heavy on top (I miss phone books!) and leave it for 10-15 minutes. 1. Cook the quinoa per directions (~10-15 minutes). I usually just use slightly salted water but can add a bit of veggie bouillon to boost flavour. Be sure to keep the heat very low during the simmering phase. 2. While quinoa is cooking, prep your veggies. For edamame, place in a microwave safe bowl with a touch of water. Cover with wrap, and microwave ~ 2 minutes. Broccoli needs to be chopped or broken into florets first, then steamed either in microwave as with edamame, or over a pot of boiling water, for about 2-3 minutes. Rinse the broccoli with cold water once ‘a dente’ so that it doesn’t overcook. For raw veggies, simply chop into nice-looking rings or slices (in this case, beets and radishes). 3. Prepare the pressed tofu. Slice the block into 5-6 fairly thick slabs (1-2 cm each). Warm 2 tsp of olive oil (or 1 olive + 1 sesame) in a large frying pan over medium high heat. Place the tofu slabs in the oil. Quickly flip to make sure both sides get some oil. Then, cook each side for about 3-5 minutes. 4. While tofu is cooking, prepare your dressing. Simply mix all ingredients well together in a bowl or jar. 1. Place quinoa (or brown rice) in a bowl. For lower calories and lower carb, stick to ~ 1/2 cup. Pour 1 Tbsp of dressing on top and mix well. 2. Artfully arrange your veggies and tofu. 3. Liberally sprinkle sesame seeds on your tofu. Drizzle more dressing on the veggies. For 1/2 cup quinoa, half of above veggies, and 2 slabs tofu. Does not include dressing, which is about 35 cals per Tbsp. * Dressing from Abbey’s Kitchen who also has several excellent variations that also include fruit.